I recently received a gift of some special kind of Japanese salt. If I understood correctly, this particular salt is made from seaweed and by some ancient Japanese production method. It’s beige in color and has a nice, rich taste. But I have no idea what it’s called or where it’s made. Can you find out what the heck this salt is? Also, now that I’ve asked the question, I realize I know nothing about salt in Japan. Where does it come from and how is it made? 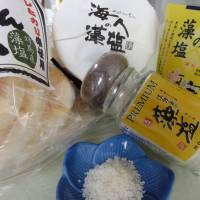 The salt you were given is called moshio, and it is indeed made from seaweed. Moshio has quite an interesting story and it has tasty flavor compounds from the seaweed, so it makes a thoughtful gift for history buffs and gourmets alike. It sounds like you may have historical curiosity as well as an interest in food, so I’ll try to cover both angles. There’s a lot we don’t know about salt-making in ancient Japan, according to Hiroki Takanashi, curator at the Tobacco and Salt Museum in Tokyo, but the very earliest method was probably burning seaweed and using the resulting ashes for their salt content. Another method seems to have involved collecting seaweed and allowing it to dry in the sun until salt crystals formed. The crystals were then washed off into vats of sea water, creating a concentrated brine that could be boiled down to yield salt. If that sounds laborious, consider that the ancients didn’t have a choice. Unlike countries with salt lakes or rock-salt deposits, Japan has virtually no land sources of salt. It was — and still is — dependent on sea water for salt production. And unlike countries with dry climates where salt can be obtained by simply letting sea water evaporate in the sun, Japan is too wet and rainy for solar-evaporation production methods. According to Shinto tradition, it was the god Shiotsuchi-Oji-no-Kami who taught people how to obtain salt from sea water. In gratitude, they built a shrine at what is now called Shiogama Jinja in the town of Shiogama, Miyagi Prefecture. Every year, starting on July 4, priests conduct a three-day ritual called moshioyaki shinji in which salt is made from seaweed according to what is believed to be the traditional method. By the eighth century, the use of seaweed was largely abandoned in favor of a new method of concentrating sea water through the use of sand terraces built near the seashore. This process involved throwing seawater over sand and letting it dry in the sun to create sand with a high salt content. The sand was collected and seawater poured through it to make salt concentrate. This remained the dominant method of salt making for thousands of years, until 1972 when a modern method using ion-exchange was adopted. Today, about 15 percent of Japan’s salt supply is manufactured domestically using ion-exchange electro-dialysis to make the concentrate and a vacuum-pan evaporator to boil it down. Most of this production goes to the edible salt market; salt for industrial purposes is imported, mostly from Mexico and Australia. Modern ion-exchange salt is of very high purity because impurities and bacteria are removed during the refining process. Unfortunately, refining also removes healthful minerals including magnesium and calcium. Some consumers and health professionals were unhappy about this, but for decades the only edible salt Japanese could come by was so-called table salt, which was sodium chloride and very little else. This is because salt came under government monopoly control in 1905 to ensure steady domestic production. (Sale of tobacco was controlled by the same branch of the government, which is how we ended up with a museum dedicated to the quirky combination of salt and tobacco.) For most of the 20th century, the production and sale of salt was strictly regulated, and even if someone wanted to produce salt by traditional methods it would have been next to impossible to get permission. But the monopoly was abolished in 1997, and in 2002, when transitional measures expired, all controls on imported salt were lifted. Today there are more than 1,500 different salt products on the Japanese market for home and commercial use. I went hunting for moshio and found products from four different locations around Japan: Awajishima in Hyogo Prefecture; Shiogama in Miyagi Prefecture; Kami-Kamagari in Hiroshima Prefecture; and Tsushima in Nagasaki Prefecture. There are subtle differences in color and taste, but they are all very nice salts. 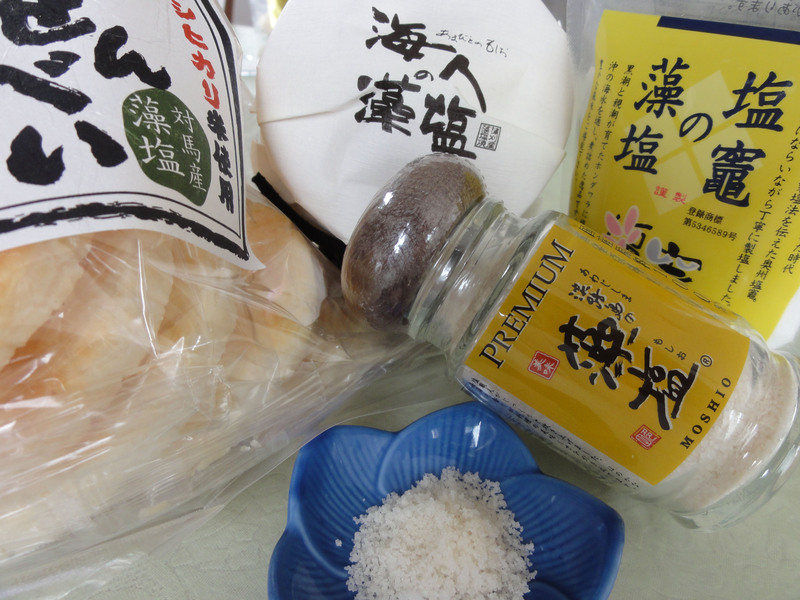 A gourmet salt vendor in the United States offers moshio as a “premium Japanese finishing salt” touted for its umami compounds from seaweed. Closer to home, I found udon noodles and rice crackers made with moshio in an upscale supermarket in Tokyo. And I just learned that Kyodo Milk Industries, the Tokyo-based manufacturer of Meito brand puddings, will release a limited-edition vanilla salt pudding made with moshio on July 2. For more on this topic, including photos of moshio in the making in Shiogama, as well as a link to an English-language video on the salt-terrace method, please visit my blog at www.alicegordenker.wordpress.com. The Tobacco and Salt Museum has permanent exhibits on traditional salt production. There isn’t much English signage, but you can buy an English guide to the exhibitions in the gift shop for ¥1,000. The shop sells moshio too. The museum is a 10-minute walk from Shibuya Station, at 1-16-8 Jinnan, Shibuya-ku, Tokyo. It’s open 10 a.m. to 6 p.m., last entry 5:30 p.m., and closed Mondays except on national holidays. Admission is ¥100 for adults and ¥50 for school-age children. Puzzled by something you’ve seen? Send a description, or better yet a photo, to whattheheckjt@yahoo.co.jp or Alice Gordenker, A&E Dept., The Japan Times, 4-5-4, Shibaura 4-chome, Minato-ku, Tokyo 108-8071.